Today is the 4th installment of "The Holiday Series" - a Holiday-themed Multi-Blogger Collaboration among myself and a dozen ore of my blogging friends. Today there are ten of us sharing Holiday Wedding Looks. And I couldn't help but notice (look at the collage right below) how the majority of us chose to wear black. Black is great anytime and perfect for any special occasion and I happen to think black is a great color to wear to a Winter or Holiday/December Wedding, though I usually stay away from black at weddings in other seasons. I also noticed that most of us wore pumps. Pumps are the best, most classic kind of shoe to wear for a dressy event. I love that a couple of these beauties chose pants/jumpsuit instead of a LBD. Gorgeous Kellyann even chose a Black Velvet Dress too, you can never go wrong with a wrap dress. The adorable Chrissy (I love her hair up) and classic Christine paired skirts with pretty, dressy tops. I also love how Chrissy and Whitney stand out in their burgundy pieces - wine is another fantastic color to wear to a Holiday Wedding. And look at Linda's Oh-La-La Gold Sequined Mini Dress - it says fun, dancing, holiday party!! My favorite outfits here are Shelbee's and Christine's. Both are layered to perfection and I must say Kristin who has been a part of many Wedding Looks with me, nails it every time! Check out all these gorgeous ladies, don't we all look great?! 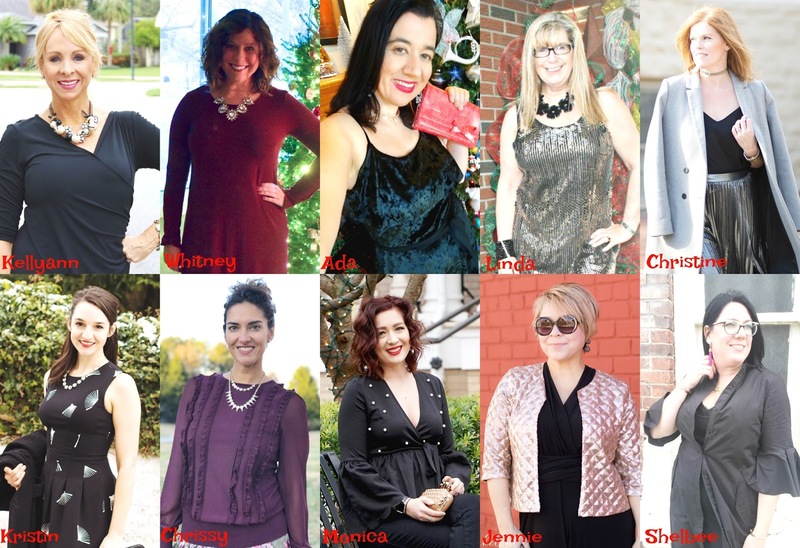 I mentioned a few days ago in this post my huge love and adornent of Who What Wear's Holiday collection. The current Who What Wear collection at Target has some stunning Holiday pieces. I had my eye on so many gorgeous pieces from that collection like this Satin Tie, Midi-Length, Velvet Little Black Dress which I paired with these Blush Velvet Pumps with Black Satin Ankle Straps and originally - since it is Winter and I need something on top lol - I was going to wear this Quilted, Kimono-Style Black Floral Jacket which they sent me the wrong size and I haven't gotten the replacement yet so imagine my LBD as styled here with these pieces but with the kimono jacket over it. The modern jacket looks so good over the dress and it is unique and different from most pieces you see at a wedding like fur jackets, moto leather jackets, fur scarves/snoods, bolero jackets, a blazer, cropped cardigans or regular cardigans. 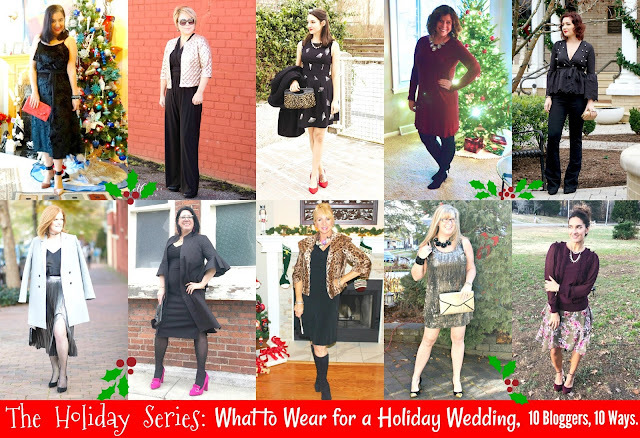 So here is a dressy, Winter Wedding look done head to toe in Who What Wear pieces. THE LITTLE BLACK VELVET DRESS. I love this Satin Tie, Midi-Length, Velvet Little Black Dress that I purchased this Winter from Who What Wear. If you have yet to shop that clothing line, I suggest you check it out. It is so well-made and good for the price. It has clothes for the office, the weekend, special occasions and beyond. A little black dress in velvet is the perfect dress to wear for a December Wedding since it is the Holiday season. Velvet is the IT Material of the season - so rich, elegant, dressy and beautiful. I love that this dress is in a midi length which makes it Wintery. The sash tie belt is in chiffon - it is very long, so I wrapped it three times around my waist. For reference I am wearing a Small in the dress. This Crushed Velvet Patterned Black Cropped Kimono Jacket would look gorgeous over this dress, too. Kellyann: "This time of year I am reaching for something with a little glamour yet comfortable. This faux wrap dress in black is a classic piece but by adding a fun statement necklace and my short leopard coat I've added a little glamour." Kristin: "Would you guess that two of the items in my winter wedding look are secondhand? This black and white printed dress and coat are both thrifted! 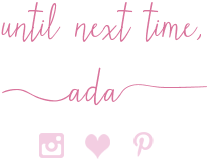 I'm talking about where I thrift in my post as well as my aversion to tights... I don't care how cold it is, if I have the choice I'll take my chances with bare legs!" Whitney: "I'm not actually attending any weddings this season. If I were, I probably would have wanted to buy a pretty, new holiday dress. 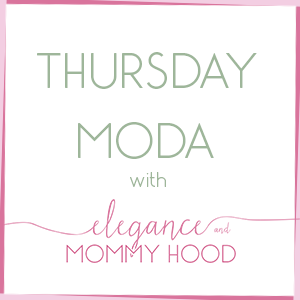 But instead, this post was a good exercise in wardrobe remixing!" Chrissy: "When I think “Christmas wedding” I think silvers, blacks, reds etc, but I couldn’t resist going with this deep burgundy, ruffle top and floral skirt. These colors are everywhere right now!" 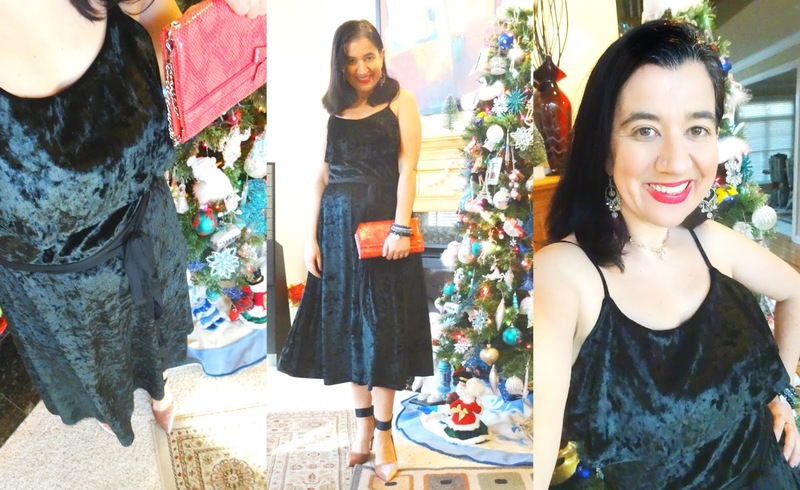 Ada: "A little black dress in velvet is the perfect dress to wear for a December Wedding since it is the Holiday season. Velvet is the IT Material of the season - so rich, elegant, dressy and beautiful. I love that this dress is in a midi length which makes it Wintery and for a pop of color I chose a coral python clutch, blush velvet pumps with a blush pink lace choker and red lipstick. I'd also wear this elegant floral kimono jacket over the dress to keep myself warm and layers are a must for a Winter Wedding or Holiday Party." Monica: "I hope everyone is enjoying their holiday season before. As always, thanks Ada for the fun collab! Today I've decided that for a holiday wedding I want to be comfortable and wear pants. I paired the pants with a fun pearl top​." Linda: "Going for a Winter Wedding on New Years Look: Heels to start off for the more traditional look and of course a great pair of chucks for dancing into the night. 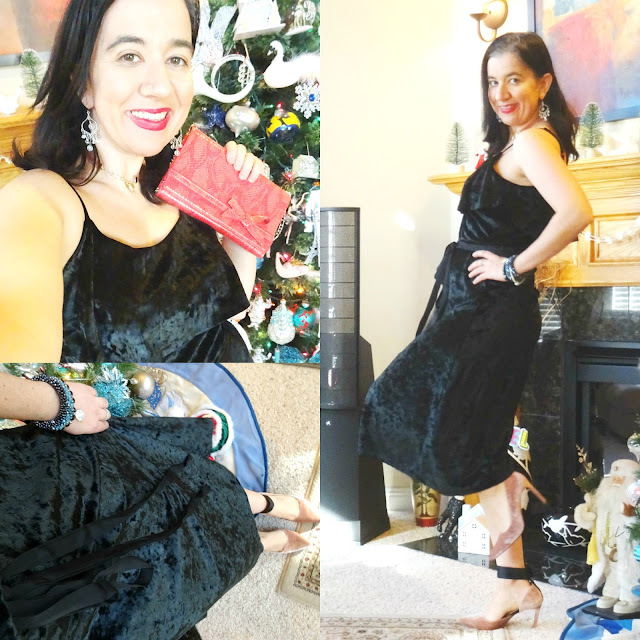 I do have a shawl I will wear to cover my shoulders but heck, how fun is this amazing sequin dress from Charlotte Russe paired with J Crew Pumps or black converse." Jennie - "A black jumpsuit is an elegant look perfect for weddings, especially in winter when you also want to stay warm. Topping it off with a bit of sparkle makes it perfectly festive for the season!" Christine: "What I love most about this silver metallic pleated skirt is the fit and how flowy it is. This is such an elegant and chic outfit to wear to a Holiday Winter Wedding. Simply dress it up with a black satin camisole, fishnet tights, classic black pumps and layer your favorite winter coat et voila!" Shelbee: "For my winter wedding outfit, I went for more of a dressy casual look with layered little black dresses: a button front shirt dress over a body con dress. I kept my accessories simple with a gold link floral necklace and a black clutch. Then I let my bright pink heeled loafers be the statement. My feeling is you can never go wrong with a little black dress and some fabulous shoes for just about any occasion!" My Bright Coral Python Clutch is from White House Black Market from about 7 years ago - they always have cute unique purses and clutches. It is so well made, small+compact but it carries the essentials. The inside is shaped like a wallet so you can fit money, cards and it has room for your cell-phone, a lipstick, a compact powder or blush and a pen if you need it. The inside has a built-in mirror too and it also has a long chain strap you can wear it with instead. I love the skinny side bow, it makes it more fancy and perfect for a holiday. The Silver Beaded Chandelier Earrings are also from White House Black Market from years ago and I have worn them a million times and they still look brand-new. I thought the black velvet dress would look good with a choker so I wore my Blush Pink Lace Choker Necklace by Express - plus it brings out the blush pumps. I mixed and matched a few sparkly bracelets. The Light Blue and Navy Woven Beaded Bracelets are from Nordstrom while the Black Beaded Bracelet with the circle pave charm and the Silver Woven Bracelet with the Pave Ring are both from The Limited from a little over a year ago. And of course I wore one of my million red lipsticks because red lipstick is the way to go for a wedding, especially during the holiday season and I believe it is the best accessory for this type of occasion. I forgot to wear a fun cocktail ring though. For my lipstick I have on this Revlon beauty which is a steal at 5 bucks. I mixed two of them the "Love That Red" with the "Naught Plum". And if you are looking for ideas on what or how to dress a little girl or toddler girl to a Winter Holiday Wedding look no further than my previous post. Vivian wore her own gorgeous fancy dress and also has some velvet on. Go show her some love, please!